Just because you’re on a low-carb diet, doesn’t mean you have to say “no” to dessert. 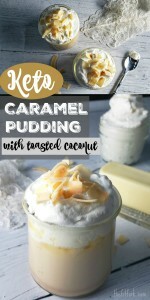 My Keto Caramel Pudding with Toasted Coconut is rich, creamy and indulgent —without the sugar. 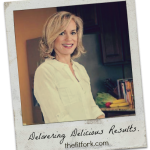 It’s a luxurious, low-carb treat and keto dessert you can gift to yourself (you deserve it) or prepare for company during this upcoming holiday season. Hiland Dairy products, including whole milk, butter and whipping cream, make Keto Caramel Pudding with Toasted Coconut a recipe I feel good about serving family and friends. 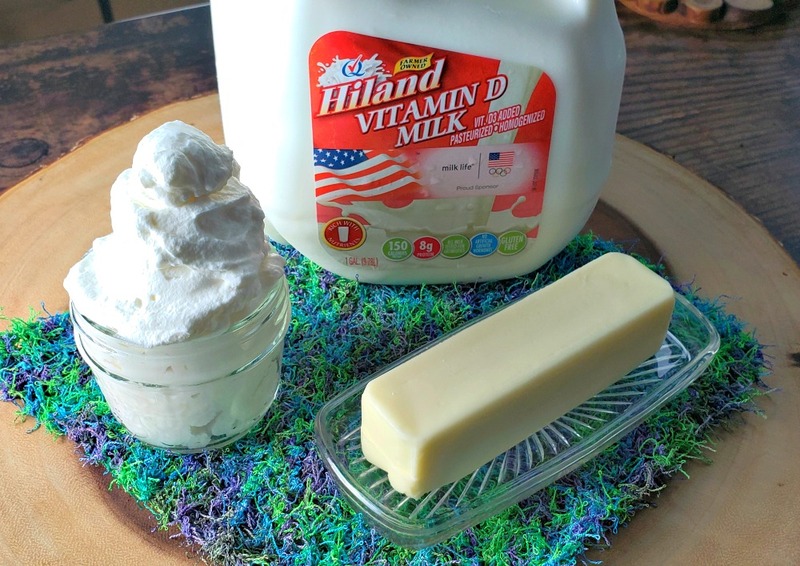 Sourced from local dairy farms and free of artificial growth hormones, Hiland Dairy milk is creamy, smooth and brimming with essential nutrients. Their heavy cream is just as fantastic and whips up into fluffy, delicious sugar-free whipped cream — a homemade touch that always gets high-fives! And, the butter . . . what’s NOT to love?! 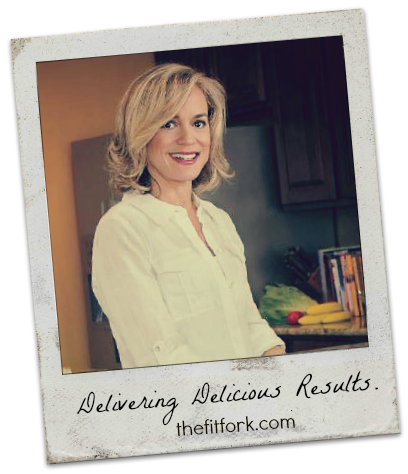 Butter makes everything better and is my go-to way to add richness to a low-carb dessert. To keep the recipe high in fat and super low in carbohydrates (only 3.5g carbs per serving), I used a natural and relatively new sugar substitute called Allulose. It’s NOT an artificial sweetener, but a “rare” sugar that is extracted from only a few foods like wheat, figs, and raisins. It looks, tastes and acts like white granulated sugar (just a “bit” less sweet), making it the perfect swap in so many recipes – even making the sugar-free caramel starter for my keto dessert recipe. If you don’t have Allulose, a cup-for-cup measure granulated Stevia will also work. The key to getting a nice caramel color and the taste is letting the butter and sugar substitute melt and simmer together in a saucepan long enough to get a golden amber color but not so long that it burns – keep an eye on this step and stir frequently. Next, you add the cream, then the milk! Many puddings call for flour to thicken, but this adds a noticeable amount of carbohydrate (and gluten, if that is a concern). I simply use a small amount of unflavored gelatin dissolved in an equal part water and mix it after taking it off the heat. No dessert, in my opinion, is complete without homemade whipped cream. 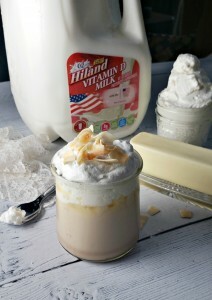 Whipped cream turns the ordinary into the extraordinary and Hiland Dairy heavy whipping cream always comes through. Simply pour into a mixer bowl, using the whisk attachment, and beat until fluffy. If you like sweet whipping cream, add a few drops of liquid stevia before turning the mixer on. After the keto pudding sets in the fridge, it’s topped with this yummy whip and a sprinkling of toasted coconut chips, if desired. This is a low-carb dessert that will soothe even the most savage sweet tooth. When it comes to holiday treats, are you a DIY (do it yourself) or DIFM (do it for me)? For special occasions, I’m DEFINITELY a DIY kind of person, it just puts me in the holiday spirit to be in the kitchen making yummy things. Sometimes though, life gets in the way of my holiday planning, and I’d rather have someone DIFM – haha! When that happens, like if I have to pick up a store-bought pie or carton or tub of gelato, I know I can always make it special by mixing up some sugar-free whipped cream like I just described. This holiday hack makes everything look homemade, takes only 5 minutes and makes dessert taste 500 times better! Melt butter over medium heat in a medium sauce pot. Once melted, add sugar substitute and lower heat slightly. Let lightly simmer for approximately 3 to 5 minutes, stirring constantly, until turning golden amber. Watch carefully to ensure it doesn’t burn. Whisk in one cup of heavy cream and continue to simmer on medium-low heat for 4 minutes. Next, add one cup of milk, simmer for 6 more minutes. Turn off heat. Mix gelatin with water and let sit for 1 minute, then turn the burner back on and whisk into pudding mixture. The gelled chunks should dissolve into pudding mixture. Let pudding mixture cool for 5 minutes and then pour evenly into six 6 to 8-ounce ramekins or small jars. Place in fridge to set up for 30 minutes. While pudding is setting, pour 1/2 cup whipped cream into a mixer (up to 10 drops of liquid stevia, more or less depending on preference for sweetness). Whip using whisk attachment for approximately 3 minutes or until stiff, but not overworked. Add approximately 2 tablespoons on whipped cream to each pudding, top with a sprinkle of toasted coconut chips.